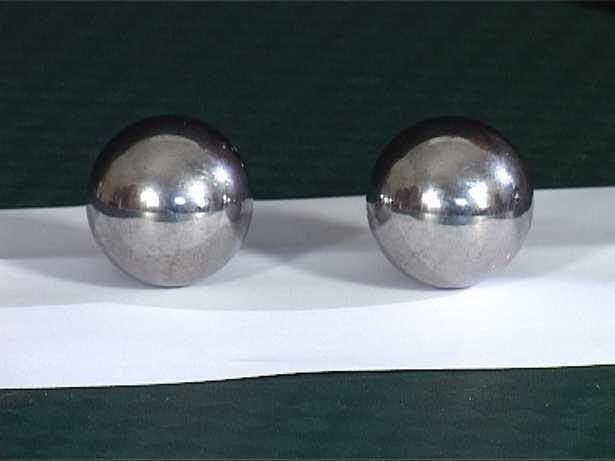 These large ball bearings are about 2 inches in diameter, and a pair of them weight over a kilo!When you bang them together smartly, there is a loud 'crack'. However there is also heat generated at the point of impact. So if you crack them together with a sheet of paper in between, you discover that the heat generated actually burns a small hole in the paper! Paper burns at 450 Fahrenheit, so this suggests that we are reaching that kind of temperature at the point of impact. Ball bearings are manufactured to extremely fine tolerances, so of course the contact area between two ball bearings is vanishingly small. We have not managed to set the paper on fire, even when we used flash paper. This may be bacause at the point of impact, the movement of the air blows out any incipient flame. However a fascinating demonstration of the conversion of kinetic energy into heat energy! Quality, heavy, fun to demonstrate the effect of burning paper & a wonderful relaxation tool (spinning them around each other in one hand -I highly reccomend. My son is delighted with the large ball bearings. He loves them. They are large and ball like. :).